Whistler In The Dark Theatre begins 2010 with "One Flea Spare," Naomi Wallace’s lyrical exploration of the politics of compassion in the year of the London Plague. 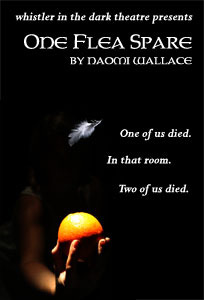 Performances at The Factory Theatre, 791 Tremont Street in Boston, run February 5 - 21. The production is directed by Whistler's Artistic Director, Meg Taintor. On the last day of quarantine, a wealthy couple’s house is invaded by two strangers - a sailor and a girl who might not be what she seems. And so they must begin another month of quarantine…together. Watched over by their jailor, these four with nothing in common must find a way to survive both the plague and each other. Alliances and betrayals, bargains and games. Wallace creates a darkly poetic look at a world where the Plague has leveled class distinctions and left the survivors free to invent their own rules and codes. The cast features Ben Chase, Jeff Gill, Curt Klump, Lorna Nogueira and Jennifer O’Connor. "One Flea Spare" was commissioned and produced in October 1995 by the Bush Theatre in London. It received its American premiere at the Humana Festival and was awarded the 1996 Susan Smith Blackburn Prize, the 1996 Fellowship of Southern Writers Drama Award, the 1996 Kesselring Prize, and the 1997 Obie Award for Best Play. Naomi Wallace will premiere her newest play, "The Inland Sea," in London this spring.